Every aspiring songwriter has a list of the greatest songwriters of all-time that they look to for inspiration. 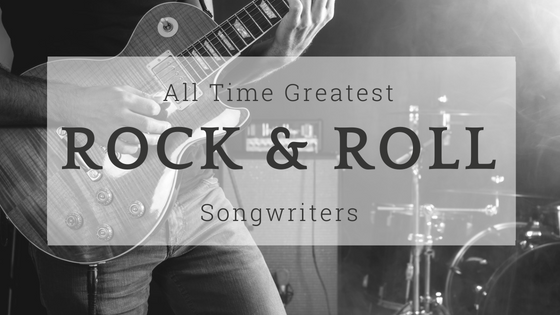 The best songwriters in rock and roll history have achieved this recognition through an extensive catalog of songs, either performed by themselves or other rock and roll legends, that often stretch over decades. If you’re looking for motivation in your singer songwriter career, you can start by listening to the music of these top songwriters. John Lennon and Paul McCartney – While the duo certainly wrote their own hits, they’re arguably most famous for their collaborations of many of the Beatles’ greatest hits. “She Loves You,” “I Want to Hold Your Hand” and “Eight Days A Week” were all joint songwriter ventures while Lennon wrote “Lucy in the Sky with Diamonds,” “Across the Universe” and “Strawberry Fields Forever” and McCartney penned “Love Me Do,” “All My Loving,” and “Yesterday.” With so many rock and roll hits, it’s no wonder this pair is known as a couple of the best songwriters of all time. Paul Simon – As part of Simon & Garfunkel, Paul Simon wrote “Bridge Over Troubled Water,” “Mrs. Robinson” and “The Sound of Silence” but this singer songwriter was just get started when the duo broke up in 1970. He went on to have solo hits with “Kodachrome,” “You Can Call Me Al” and “Me and Julio Down by the Schoolyard.” With sixteen Grammys under his belt, he’s undoubtedly earned his place among the top songwriters in history. Bob Dylan – For six decades, Bob Dylan has penned countless hits for both himself and other notable musicians, including Peter, Paul & Mary and Sonny & Cher. After writing song like, “Blowin’ in the Wind” and “The Times They Are a-Changin’,” which served as inspiration for the Civil Rights Movement of the 1960s, he became known for tackling social and political issues in his songs. Other songs such as, “Like A Rolling Stone,” “Knockin’ on Heaven’s Door” and “Forever Young,” have withstood the test of time to touch multiple generations and solidify Dylan as one of the greatest songwriters in the world. Brian Wilson – The Beach Boys represented the feel-good vibe of the 1960s and Wilson had a hand in writing more than two dozen rock n roll hits for the iconic band. Among the top songs for this talented lyric writer are “Good Vibrations,” “Wouldn’t It Be Nice” and “California Girls,” which became anthems for beachgoers across the globe. There’s no doubt that rock and roll music wouldn’t be the same without Wilson’s song writing contributions to the genre. Carole King – Although Carole King wrote many of her songs with her then-husband Gerry Goffin, she’s the one who became a household name by being an inspiration for aspiring female singer songwriters during the 1970s. Her own songs, like “It’s Too Late,” “You’ve Got a Friend” and “I Feel the Earth Move,” spoke to a generation of young women. With 118 pop song on the Billboard Hot 100 through 1999, King earned her title of most successful female songwriter of the 20th century. Mick Jagger and Keith Richards – The Rolling Stones pair bounced ideas off of each other for many of the band’s hit songs. “(I Can’t Get No) Satisfaction,” “Paint It Black” and “Sympathy for the Devil” were just a few of the British band’s smash rock and roll hits over the years. With two of the best songwriters pumping out songs, it should come as no surprise that the Rolling Stone’s career has spanned nearly six decades. Smokey Robinson – When you think of quintessential Motown hits, a few of Smokey Robinson’s songs are bound to come to mind. The singer songwriter first hit the scene in 1960 with “Shop Around,” which became a hit single for his own act, The Miracles. He solidified his name as one of the greatest songwriters in rock and roll music by penning the Temptations’ “My Girl,” and Mary Wells’ “My Guy,” two tunes that are synonymous with Motown music to this day. Of course, this list barely touches on the extraordinary talent of the top songwriters in the world and is by no means a complete list. Other incredible rock and roll songwriters include Chuck Berry, Stevie Wonder, Elton John, Joni Mitchell, Freddie Mercury and David Bowie. Who you consider to be the best singer and songwriter is entirely subjective, but this list should at least give you a place to start exploring the top songwriters in rock and roll music. Foxhedge Music is a management company and recording studio located in historic Leipers Fork, just south of Nashville, Tennessee. Our mission is to support and encourage songwriters, who we believe are the back-beat of Music City, while continuing to invest our time and resources in the Music City community. Through Music City SongStar awards, we want to give songwriters a chance to have their music heard. We’re believers in creativity, chasing dreams and getting the chance to pursue your passion. Need inspiration? Explore Secrets to Better Songwriting.